Citation Information: J Clin Invest. 2016;126(11):4076-4087. https://doi.org/10.1172/JCI88410. 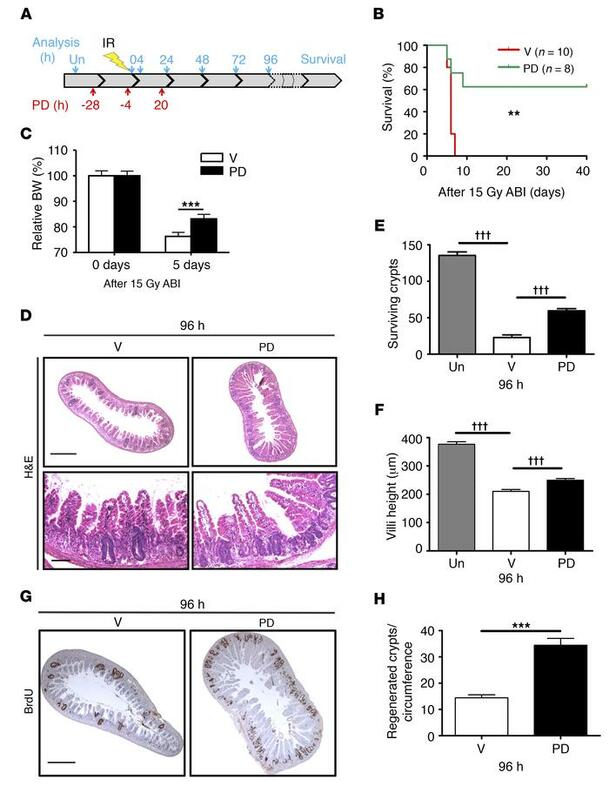 PD prevents IR-induced lethal GI injury. Mice were pretreated with vehicle (V) or PD and subjected to 15 Gy ABI or TBI. (A) Schematics of PD and radiation dosing and analyses at various time points. Un, untreated. (B) Kaplan-Meier survival curve of mice subjected to ABI. **P = 0.0035, by log-rank test. (C) Relative BW on day 5 after ABI compared with BW on day 0. N = 10 (V) or 8 (PD). (D) Representative images of H&E-stained intestinal sections with the indicated treatment at 96 hours. Scale bars: 500 μm (top) and 100 μm (bottom). (E) Quantitation of surviving crypts 96 hours after TBI. (F) Villus height at 96 hours. (G) Regenerated crypts marked by BrdU IHC in a cross section at 96 hours. Scale bar: 500 μm. (H) Quantification of regenerated crypts per circumference. (E, F, and H) Values represent the mean ± SEM; N = 3 mice in each group. †††P < 0.001, vehicle versus untreated or PD-treated, by 1-way ANOVA followed by Tukey’s multiple comparisons test; ***P < 0.001 vehicle versus PD treatment, by unpaired, 2-tailed Student’s t test.